« 8:00pm: Is Anxiety and Depression a Spiritual Malady? 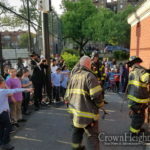 Crown Heights Shomrim had a busy Shabbos, starting off with a search for a person with special needs who walked out of his house after Shabbos began, and did not return. Shomrim mobilized a number of volunteers, who after an hour of searching was able to assist in locating him. Hatzalah was called to check him out and was transported to an area hospital. They were able to open the door and free the terrified child. Over Shabbos our Vol answered the call for a #missing special needs person that was found after a brief search. Search Underway for Missing Woman UPDATE: Found! A child locked in a room is “pikuach nefesh” and door may be broken on shabbos (shulchan oruch) . The gemora Yuma 84b says that if a child got locked behind a door one may break down the door even if it involves a biblical prohibition. The gemora says that even if one needed the splinters for firewood and is cutting the door in a manner which will thus benefit him, it is permitted. The Sha’ar Ha’tzion 328:17 says that obviously one must break the door in the quickest method possible. He may therefore not cut the door in a manner benefiting him if it requires doing more actions. The Aruch HaShulchan asks how the gemora can permit such a method of cutting when one can simply break down the door. He answers that it would frighten the child. Why destroy a door if you can just open it? what is the specific halacha for that? So amazing to live in a community where we all help each other in time of need! Happy to hear good news and a happy ending! May we all come together and help others in there time of need! While it’s nice to hear that shomrim is so helpful BH. The people who call for help do expect privacy, and posting details of what was done violates them (even when there are no names mentioned). Do you feel violated? Do we need to start a new movement? Perhaps a fundraiser? Shomrim, keep up the good work while giving the ultimate respect to peoples privacy! From what I understand 911 calls are public record.